My wife and I often talk about cultural institutions from our childhood and how they define our generation. The obvious one is Harry Potter, but it’s far from the only one. Disney‘s Renaissance; news coverage of 9/11; Max Martin‘s Britney/Backstreet Boys breakthrough. While not at the level of any of those, the Christian, lo-fi, straight-to-VHS, CGI kids’ show VeggieTales has been a surprisingly pervasive touchstone. I’ve had a discussion about the show with more than a dozen peers who all distinctly remember some scene or song or clip or character. 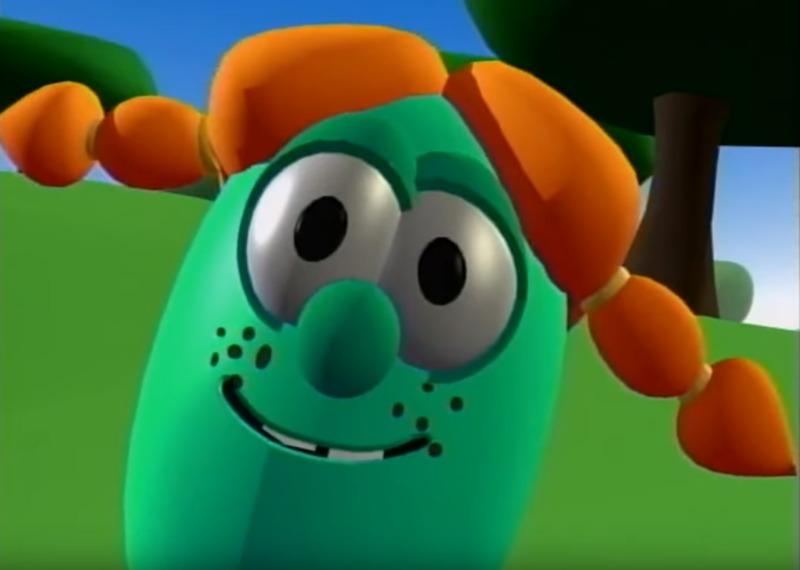 In case you’re not familiar, let me give you a quick intro: VeggieTales features vegetable characters, like Larry the Cucumber and Bob the Tomato, reliving Bible stories in child-friendly terms. There’s usually a conflict in the present for the main characters, and they find the moral, Christian solution to the problem by visiting sacred scripture. I remember the show as having a blend of a minimalist aesthetic and a touch of absurdism. I recently revisited some episodes and clips online to see if that perception held up. Answer: Sort of. On the end of things that haven’t aged well are the production values. What I remember as “minimalism” is more cheapness. The graphics are blocky, the animations jerky, and the sets amateurishly basic. Sound mixing and pacing is all over the place, with odd silences and timings cropping up frequently. I suppose you can’t blame the creators too much; I doubt they had the budget or many industry veterans on the team. Despite that, the show has a creative spark of silliness that endures. One of my favorite episodes is still a winner, “God Wants Me to Forgive Them?” Its climax revolves around Matthew 18:22, which states that we should forgive our peers “seventy times seven” times. Various characters try to figure out how many times that is. Then, a little girl grape with a hugely caricatured hillbilly accent states: “Four hundred and ninety!” What an inspired moment, inexplicably hilarious. It’s worth a watch. And if that wasn’t enough, the story is followed by a Gilligan’s Island parody. All of those examples don’t even highlight the VeggieTales single greatest artistic achievement: Occasional segments called Silly Songs with Larry (“the part of the show where Larry comes out and sings a silly song”). They were full on musical comedy sketches, completely abandoning the show’s evangelizing pretext for a few minutes. Some of them were great and truly absurd: An opera about a lost hairbrush. A therapy session for someone obsessed with his own lips. A dramatic love letter to a cheeseburger. The seminal piece “The Pirates Who Don’t Do Anything.” Great stuff, I tell you. The album’s best moment is a cover of “I Can Be Your Friend” by The O.C. Supertones. The Supertones are one of two essential Christian ska bands (along with Five Iron Frenzy). Their version of “I Can Be Your Friend” has a clean production and a huge, soaring chorus that will stay in your head for days. 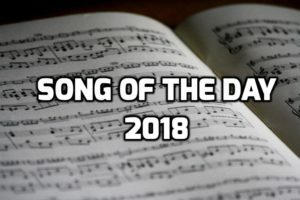 The verses feature silly voices that are on-brand for the show, but the whole thing gels as a “Why Can’t We Be Friends”– or “We’re All Dudes”-type number: a proclamation of love for all. It’s a great tribute to a great musical franchise. “News coverage of 9/11” is one of my favorite songs, too. Now thanks to you, I know what to call its distinctive structure. Overall, my favorite chapter in the series has always been “King George and the Ducky” – great musical storytelling… even if David and Bathsheba is a pretty dark and twisted selection for kids’ fare. Since you called it out, I looked it up to verify. It turns out I mixed up “rondo” and “canon” and have corrected the post. My B.